Dahlias in a Green Vase. Photo by Amy Stewart. For the last month, I have stood guiltily by and watched my flower garden fade. The daisies, feverfew, butterfly bush and catmint have bloomed so aggressively that I couldn't possibly keep up with them. After hacking his way through the flowers to get to the chicken coop recently, my husband meekly suggested that I could cut a few flowers and bring them into our bookstore. I had assumed that my flowers would be banned from the store on the grounds that they shed pollen on the books, introduce spiders and other charming but unwelcome creatures, and aggravate allergies. But having flowers by the counter has been nice, and the Shasta daisies in particular have proven to be well-behaved and long-lasting. Really, there is no excuse not to fill the house with flowers in the summer. Most flowering perennials need to be cut in order to keep blooming; if you do this regularly, you'll avoid the late summer gaps in the border that I'm about to start experiencing as the summer flowers wither and fall-blooming plants have not yet gotten going. Step one. Fill a vase with just one kind of flower. That's it. There is no step two. If you spend much time in a flower shop, you will quickly develop this idea that flower arrangements are complex orchestrations of focals and fillers, complementary colors and textures, and carefully calibrated shapes held together with wire and foam. But even florists love the single flower approach, something they call a "monobotanical" arrangement. It’s simple, clean, and it puts the focus on the flower itself, not on the design. So do this instead. Fill an assortment of vases with water and bring them outside. Include a few larger vases that can hold dozens of flowers, but also bring some bud vases, votive candle holders, small bowls, teacups, shot glasses -- whatever you’ve got. If you’re feeling particularly industrious, add a few drops of bleach and a splash of lemon-lime soda to the water. This gives the flowers sugar, citric acid and something to kill the bacteria, which more or less replicates what’s in commercial flower food. Then walk around with your pruning shears and do some damage. Start with the flowers that are threatening to take over your garden. Pick bunches of them, stripping off the lower leaves as you walk. Fill the larger vases with those flowers. Remember, just one kind of flower per vase. They all match; they look great together; they’ll all wilt at the same time. That’s it. You’re done. Now you’re left with those odds and ends -- that individual lily or rose, that hydrangea with only three presentable blossoms, the clematis that is only just starting to bloom. Resist the temptation to gather them all up and stuff them into one vase as a sort of floral all-you-can-eat. Instead, just put a single flower into a single vase. Repeat. Repeat again. Florists know that repetition is what makes a flower arrangement work, and you can use that idea to your advantage. 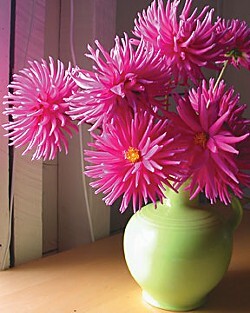 One little flower placed on every windowsill in your house will make it look like you have a house full of flowers. A row of little flowers in little vases running the length of the dining room table is far more interesting and effective than one giant centerpiece. Oh, and one other advantage to the single-flower-in-a-single-vase arrangement: It is the easiest thing in the world to toss one withered rose on the compost pile and replace it with another one. This is something even I can manage. So that’s your handy garden tip for the month. And speaking of flowers, bulb season will be here before you know it. Many of the bulb companies -- Brent & Becky’s Bulbs, Old House Gardens, White Flower Farms -- will reward you for ordering early by giving you a discount. It helps them by letting them know how many bulbs to order, and you can often get interesting and unusual varieties that will be sold out later in the season. So: Vases. Flowers. Bulbs. Get out there. You know what you have to do.